Colorado Firecamp - Engine Boss, "How to Operate a Fire Apparatus Mechanic"
By Lt. Bill Dyer, Chaffee County Fire Protection District. Based on “How To Operate a Helicopter Mechanic” by William Dykes. A long, long time ago, back in the days of iron men and horse-drawn pumpers, a ritual began. It takes place when a Firefighter approaches a mechanic to report some difficulty with his apparatus. All mechanics seem to be aware of the ritual, which leads to the conclusion that it's included somewhere in their training, and most are diligent in practicing it. New Firefighters are largely ignorant of the ritual because it's neither included in their training, nor handed down to them by older Firefighters. Older Firefighters feel that the pain of learning everything the hard way was so exquisite, that they shouldn't deny anyone the pleasure. 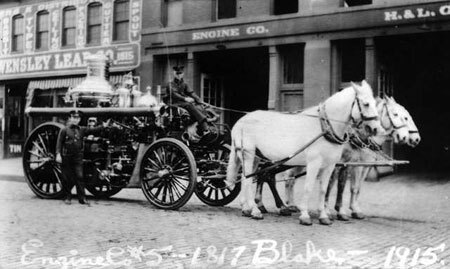 Engine Co. #5, horse-drawn steamer fire engine in Denver, Colorado in 1915. There are Firefighters who refuse to recognize the ritual as a serious professional amenity, no matter how many times they perform it, and are driven to distraction by it. Some take it personally. They get red in the face, fume and boil, and do foolish dances. Some try to take it as a joke, but it's always dead serious. Most Firefighters find they can't change it, and so accept it and try to practice it with some grace. Like most rituals, this one has it's roots in antiquity and a basis in experience and common sense. 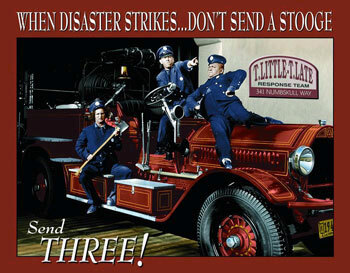 It started back when mechanics first learned to operate Firefighters, and still serves a number of purposes. It's most important function is that it is a good basic diagnostic technique. Causing the Firefighter to explain the symptoms of the problem several times in increasing detail not only saves troubleshooting time, but gives the mechanic insight into the Firefighter's knowledge of how the machine works, and his state of mind. 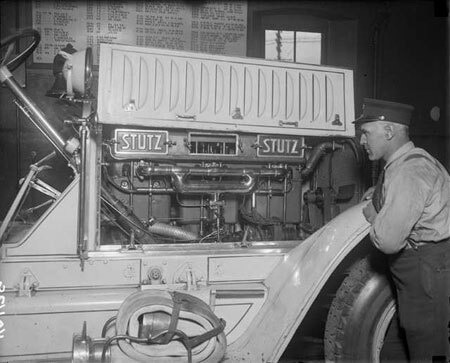 Denver fireman looking at Stutz Motor / photo by Harry M. Rhoads. Every mechanic knows that if the last run was performed at night or in bad weather, some of the problems reported are imagined, some exaggerated, and some are real. Likewise, a personal problem, especially romantic or financial, but including simple fatigue, affects a Firefighter's perception of every little rattle and thump. There are also chronic whiners and complainers to be weeded out and dealt with. While performing the ritual, an unscrupulous mechanic can find out if the Firefighter can be easily intimidated. If the Engineer has an obvious personality disorder like prejudices, pet peeves, tender spots, or other manias, they will stick out like handles, with which he can be steered around. There is a proper way to operate a mechanic as well. Don't confuse “operating” a mechanic with “putting one in his place.” The worst and most often repeated mistake is to try to establish an “I'm the Firefighter, and you're just the mechanic” hierarchy. Although a lot of mechanics can and do fight fires recreationally, they could give a damn about doing it for a living. Their satisfaction comes from working on complex and expensive machinery. As a Firefighter, you are neither feared nor envied, but merely tolerated. Until they actually train monkeys to run a pump, he needs a Firefighter to put the parts in motion so he can tell if everything is working properly. The Engineer who tries to put a mechanic in his “place” is headed for a fall. Sooner or later, he'll try to engage the pump while the engine is still in gear. After the Engineer has rammed the deluge gun into the bay door and completely burnt out the pump, he'll see the mechanic there sporting a funny little smirk. A good mechanic's personality should contain unpredictable mixtures of irascibility and nonchalance, and should exhibit at least some bizarre behavior. Clean your fire truck. Get out a hose or bucket, a broom, and some rags, and at some strange time of day, like early morning, or when you would normally take your afternoon nap, start cleaning that rig from top to bottom, inside and out. This is guaranteed to knock even the sourest old wrench off balance. He'll be suspicious, but he'll be attracted to this strange behavior like a passing motorist to a roadside accident. He may even join in to make sure you don't break anything. Before you know it , you'll be talking to each other about the fire truck while you're getting a more intimate knowledge of it. Maybe while you're mucking out the passenger cab, you'll see how rude it is to leave coffee cups, candy wrappers, cigarette butts, and other trash behind to be cleaned up. Do a thorough pre-run check. Most mechanics are willing to admit to themselves that they might make a mistake, and since a lot of his work must be done at night or in a hurry, a good one likes to have his work checked. Of course he'd rather have another mechanic do the checking, but an Engineer is better than nothing. Although they cultivate a deadpan, don't-give-a-damn attitude, mechanics have nightmares about forgetting to torque a nut or leaving tools on top of a tire. A mechanic will let little gigs slide on a machine that is never checked before a run, not because they won't be noticed, but because he figures the Engineer will overlook something big someday, and the whole thing will end up in a smoking pile of rubble anyway. Don't abuse the machinery. Mechanics see Firefighters come and go, so you won't impress one in a thousand mechanics with what you can make the pump do. They all know she'll lift more than rated suction, and will pump for days on end. While the Engineer is confident that the pump and engine and massive frame members will take it, the mechanic knows that it's the seals and bearings and rivets deep in the guts of the machine that fail from abuse. In an Engineer, mechanics aren't looking for fancy expensive clothes, flashy girlfriends, tricky maneuvers, and lots of juicy stories about “The Big One.” They're looking for one who'll drive the thing so that all the components make their full service life. They also know that high maintenance costs are a good excuse to keep salaries low. Do a post-run inspection. Nothing feels more deliciously dashing than to end the day by stepping down from the cab, petting the station Dalmatian and walking off into the sunset. It's the stuff that beer commercials are made of. The trouble is, it leaves the Firefighter ignorant of how the apparatus has fared after a hard days work, and leaves the wrench doing a slow burn. The mechanic is an expert, not a groom, and needs some fresh, first hand information on the apparatus's performance if he is to have it ready to go the next day. A little end-of-the-day conference also gives you one more chance to get him in the short ribs. Tell him the thing ran good. It's been known to make them faint dead away. As you can see, operating a fire apparatus mechanic is simple, but it is not easy. What it boils down to is that if a Firefighter performs his Firefighter rituals religiously in no time at all he will find the mechanic operating smoothly. I have not attempted to explain how to make friends with a mechanic, for that is not known. Apparatus Engineers and mechanics have a strange relationship. It's a symbiotic partnership because one's job depends on the other, but it's an adversary situation too, since one's job is to provide the apparatus with loving care, and the other's is to provide wear and tear. Firefighters will probably always regard mechanics as lazy, lecherous, intemperate swine who couldn't make it through probationary training, and mechanics will always be convinced that Firefighters are petulant children with pathological ego problems, a big lightbar, and a little whatchamacallit. Both points of view are viciously slanderous, of course, and only partly true.